Before I share this important katha with you, let me answer some of your inquiries. Recently, a Netizen whom had interest in amulets from Thailand wrote in asking, ” What is an amulet? ” He shared with me his experience of having a downside in his life before he had his first amulet. Strangely after he wore them for weeks things turn for the better and he had been searching for an answer since. 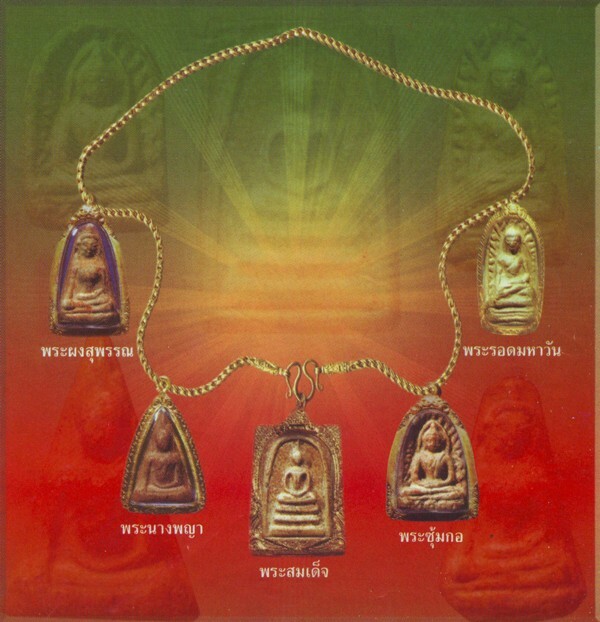 Basically forÂ amulets we wearÂ are categorize either as Phra Kreung or Kreung Raeng. Phra Kreung means amulets which depicts forms of Buddha or his followers like Phra Sivali or Phra Sangachai or virtuous monks of which we must wear above the waistline. Kreung Raeng would include takrut, Hanuman, Chucok, Bia Gae etc which does not depicts the higher orders of Buddha and his Sanghas. Many centuries ago in Thailand, amulets or Buddha statuesÂ was made as an item of remembrance that this is the land of Buddha or as a historical proof that the teaching of Buddha resides. Those days Buddha statues were not even revered at home but strictly in temple or Wat only because a home isn’t considered pure as we lay people resides and live a family life. As time evolves to about 500 years ago, one of the first amulet worn by soldiers then was Phra Rod. “Rod” in Thai means escape. It became popular because soldiers whom wore Phra Rod to battle came back alive. It was only the recent 50 years ago, amulets became popular in Thailand which later spread to Malaysia, Singapore, Hong Kong and Taiwan. However we have to be aware of ‘gae ji acharn’ or commercial gurus who claim they can make good amulets. Now amulets, though a symbol of Buddha weÂ very much revered and respect became a collector’s item. Especially great gurus like Acharn Tim of Wat Changhai whom produced famous amulets like Luang Pu Thuad 2497 (Thai Buddhist Year). One may asked, why then did it became a collector’s item? It is much sought after because these amulets were produced and consrecated by highly attained gurus. Gurus like Luang po Sodh of Wat Pak Nam, Luang Pu Toh of Wat Pradu Chim Dee andÂ Luang Pu Thim of Wat LahanglaiÂ Â for example are highly attained gurus. They are highly attained in Dhamma and practise. In the commercial society now, such great gurus are hard to find. And those days amulets were hand made and not factory/machine manufactured like now. Therefore it is quite rare. There are many speculations on why Thai amulets are ‘potent’ or that it brings miracles or phenomenas in life. We will not dwelve into speculations. One fact, I can share with you is. This ‘potent amulets are made by holy and pureÂ materials eg, gold, crystal or certain kind of herbs or wood which by themselves are potent or have natural energy. Some gurus even restrict moulding of amulets be done by little children whom have pure minds. Then such amulets are consrecated and blessed by highly attained gurus especially in practise of meditation or samadhi.Â It is similar to highly attained kung fuÂ gurus whom not once butÂ many times shown on documentaries that concentrated qi or energy can either be constructive or destructive in use. These highly attained gurus with high level of concentration and mindfulness direct their blessingsÂ by means of victorious chants of the Buddha like Bahum-Mahaka or great blessing recitations. These are all positive recitations.Â Other than their attainment in Dhamma and practise, these gurusÂ earned great merits like educating the poor, providingÂ medical andÂ spiritual support. A good example is Luang Po Khoon of Wat Ban Rai, have build numerous schools, hospitals and upgrade the standard of living of the people in Nakorn. During the blessing and consrecation ceremony of amulets, these gurus will transfer their blessing and merits into it. These gurus too will at times inscribe acronyms of Buddha’s Victories or Buddha’s elements or commonly known as yant like Ba Ma Na Uk Ka Sa Na DukÂ or Na Mo Budh Dha Ya or Na Ma Pa Ta or Ma A U on such amulets. We don’t call this magic but it is called ‘Puttakhoon’ or Buddha’s Blessing. Lastly, all the time, such amulets were made out of charitable purposes like building or refurbishing temple or Wat or even helping disastrous victims of the Tsunami. In Buddhist Dhamma, it encourage individuals to perform dana or charity to improve one’s Karma. There is no superstitiuos in perfoming dana or doing good. Therefore the combination of the factors describe above give rise to such ‘potent’ effect in the amulet. Nothing superstitiuos, just cause and effect. One should always or encourage to practise this. Invite the Gurus and his blessings to be with us before wearing our amulets. Hold your amulets in your palm in ‘wai’ position. Next Post - Next post: How to take care and maintain amulets?